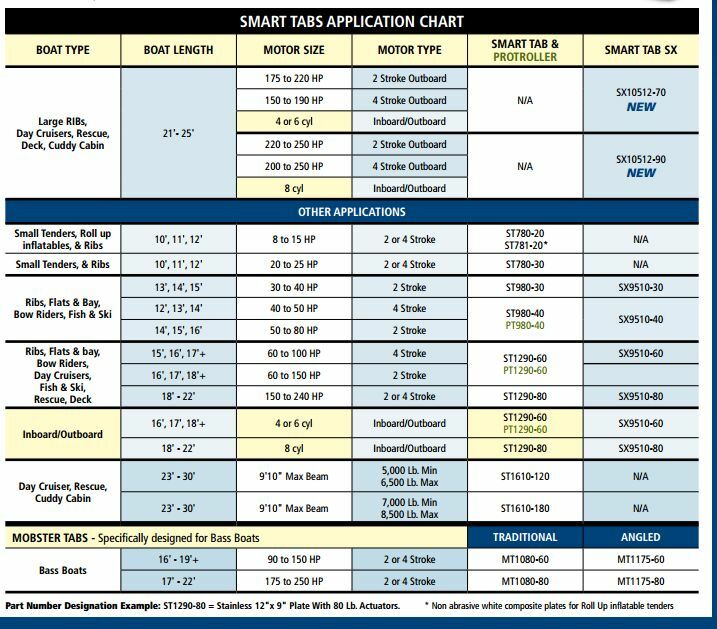 ST780-20 Smart Tabs Trim Tabs Series for boats 10 - 12 ft with 8 - 18 hp motors. 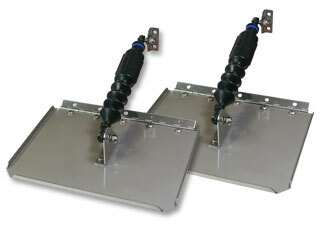 ST1290-80 Smart Tabs Trim Tabs Series for boats 18 - 22 ft with 150 - 240 hp motors. First, it is important to understand that trim tabs become an extension of the boat’s running surface, and therefore change the performance and handling characteristics as they adjust. This happens automatically with SMART TABS because they react to the water pressure, boat speed, and payload. At slow speeds they deploy downward which increases stern lift, keeping the boat more level and allowing it to plane easier at much slower speeds. At cruising speeds they are pushed up by the water pressure, but remain under a load creating ride control like shock absorbers. No need to worry about tab position when pulling a tube, wake board, or skier. Just use the boat and enjoy the benefits.